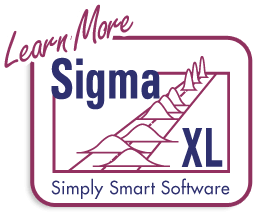 SigmaXL | Product Features | How Do I Perform Chi-Square Tests in Excel using SigmaXL? 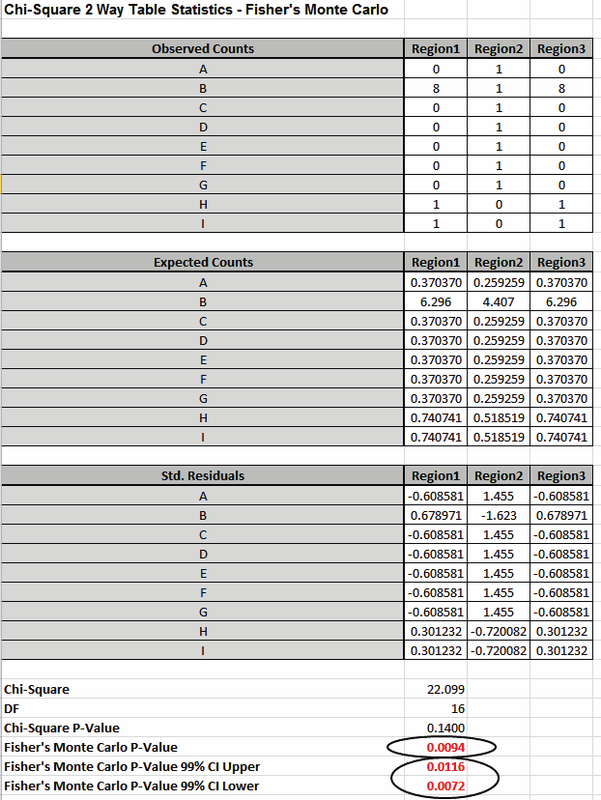 How Do I Perform Chi-Square Tests in Excel Using SigmaXL? Now we will consider a sparse data set where the Chi-Square approximation fails and Fisher’s Exact is required to give a correct conclusion for the hypothesis test. This is adapted from a subset of dental health data (oral lesions) obtained from house to house surveys that were conducted in three geographic regions of rural India [1, 2]. The Fisher’s Exact P-Value obtained with SigmaXL may be validated using these references. The data labels have been modified to a generic “A”, “B”, “C”, etc. 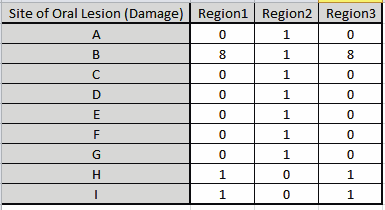 for the oral lesions location (rows) and “Region1”, “Region2” and “Region3” for the geographic regions (columns). Open the file Oral_Lesions.xlsx. This data is in Two –Way Contingency Table (or pivot table) format. Note that cells A1:D10 have been pre-selected. 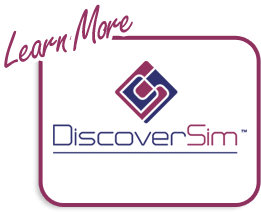 Click SigmaXL > Statistical Tools > Chi-Square Tests – Exact > Chi-Square Test – Two-Way Table Data – Fisher’s Exact. Note the selection of data includes the Row and Column labels. Note: 25 out of 27 cells have expected counts less than 5. Since more than 20% of the cells have expected counts less than 5 and several cells have an expected count less than 1, the Chi-Square P-Value = 0.14 is invalid and leads to an incorrect conclusion: Fail to Reject H0, Site of Oral Lesion and Geographic Region are independent. However with Fisher’s Exact P-Value = 0.0101, we have strong evidence to reject H0, and conclude that there is indeed a relationship between Site of Oral Lesion and Region. While this example is originally from a dental health study, it could have been Defect Type versus Supplier and highlights that the use of Fisher’s Exact for contingency tables with sparse data can make the difference between a good business decision and a bad business decision! The Exact P-Value was computed very quickly, but if the data set was larger, the required computation time could become excessive, and Monte Carlo would be required. We will rerun this analysis with Monte Carlo and discuss the output report. 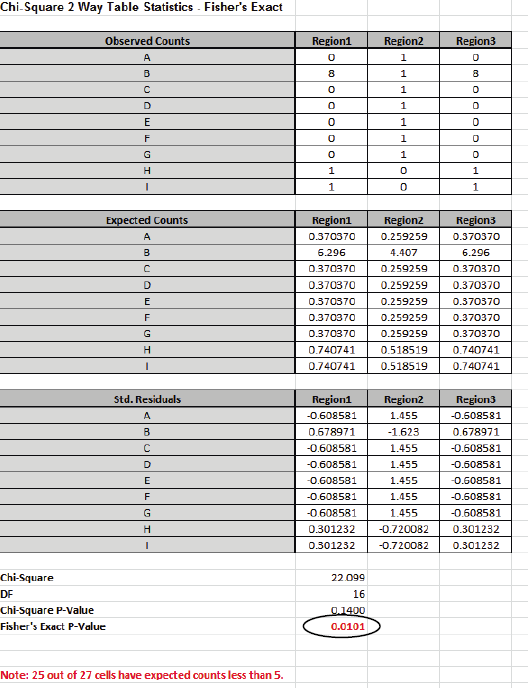 Tip: As discussed above 10,000 replications will result in a Monte Carlo P-Value that is correct to two decimal places. One million (1e6) replications will result in three decimal places of accuracy and typically require less than 60 seconds to solve for any data set. Fisher’s Monte Carlo P-Value here is 0.0094 with a 99% confidence interval of 0.0072 to 0.0116. This will be slightly different every time it is run (the Monte Carlo seed value is derived from the system clock). The true Exact P-Value = 0.0101 lies within this confidence interval. If the confidence interval is too wide (e.g., upper is a “fail-to-reject” H0 and lower is a “reject” H0), simply rerun the Monte Carlo option using a larger number of replications (use 1e5 or 1e6).